Spotted this on a tree near the entrance to a local park. The entrance is near a motorway bridge, and it was surrounded by bunches of sunflowers attached to the trees with letters to a young local man who had committed suicide a couple of years ago. The letters were from his father expressing how sorry he was that he didn’t help his son. 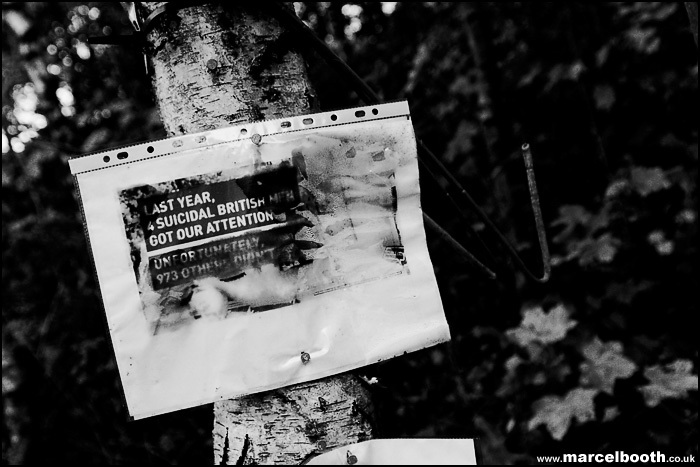 As the poster says, many many men suffer suicidal thoughts for one reason or another, either because of abuse, personal situation, depression or otherwise. Thankfully the days of the ‘pull yourself together’ stock reply are rapidly becoming a thing of the past.